Communities are a goldmine for innovation and insights, but you need to get the strategy right. Insights don’t appear by chance, they appear after a successful execution of your community strategy. 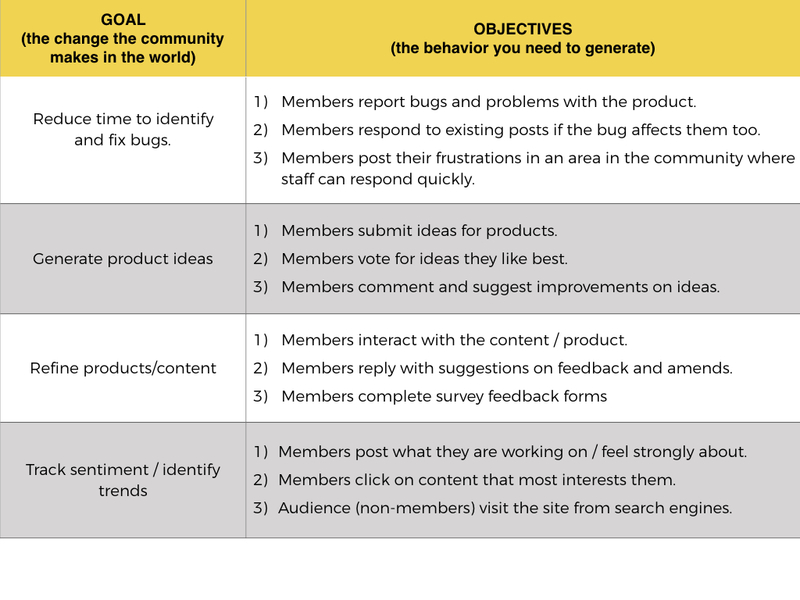 You can use a community to directly solicit ideas, gather feedback, identify bugs, track sentiment, identify popular trends, and refine ideas through getting early feedback (content, possible new features, and potential product changes). More than any other goal, innovation requires internal alliances (and strong internal relationships) to realize the value. I’ve spoken with many community managers this year who have shifted from customer support to an innovation-driven approach. It’s the most effective way to gain internal support. First, make sure the goals (the change the community makes in the world) and the objectives (behaviors you need people to perform to achieve that goal) both align. If you’re measuring engagement (clicks, likes, shares) you have the wrong objectives. The objectives should be really, really, specific here. Think very carefully what behaviors will actually achieve the goal. There should be nothing vague. If you want members to refine products/improve content, you need them to read/engage with it first (action 1), you need them to reply with suggestions/feedback in the community (action 2). You might also want them to complete surveys about the products too (action 3). That’s 3 very specific actions. All other engagement metrics are irrelevant. Now you need a strategy for each of the objectives you’ve established. (this is also why you should only have 1 goal and a max of 3 to 5 objectives). Remember strategy is about inducing an emotional state that will get people to perform the behavior you want. If you want members to report bugs, why would they do that if they’re not already? As we see above, you might decide to stress the frustration they might feel and change the environment to highlight how they could easily remove the frustration. You might focus on building a sense of pride. This might mean creating a group of people who proactively look for bugs that everyone else has missed. You might focus on jealousy, and see who can resolve the most bugs. You might focus on belonging, being part of a ‘bug squad’ that goes out there looking for bugs as part of their group identity. Only pick one strategy per objective (I know how hard it is), but any more will diminish your focus on making the strategy successful. 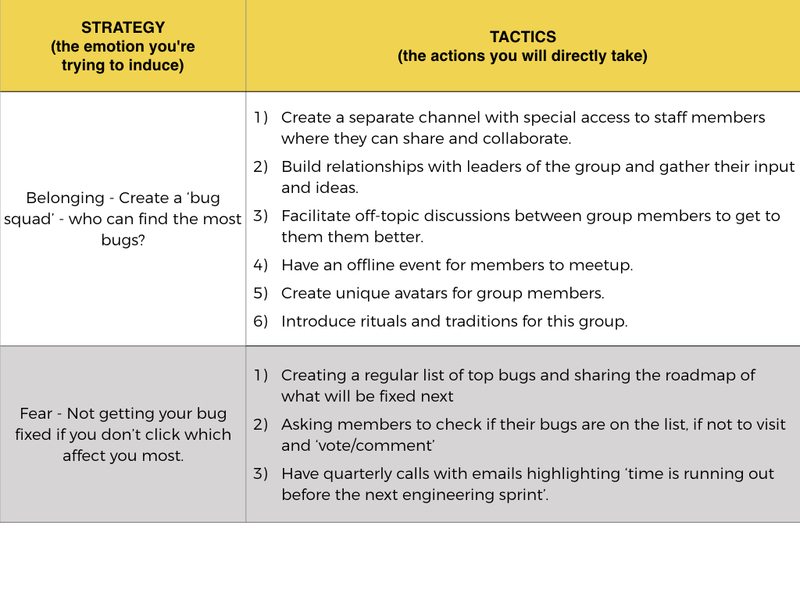 1) Belonging – Create a bug squad of insiders to seek out and report bugs. 2) Fear – not getting your bug fixed if you don’t click/share if the bug affects you too. The tactics should now fall relatively neatly into place. Create a separate place for the group to interact and collaborate – also where they have direct access to staff members. Build relationships with the leaders of the group. Facilitate off-topic bonding-related discussions for group members to interact and get to know one another better. Host an offline group meet up for members to connect. Create unique avatars members of the ‘bug squad’ can use. Creating rituals and traditions for new members of the bug squad. Whatever your strategy is, all your actions should be subservient to it. Publishing a regular list of ‘top bugs’ and sharing the roadmap. Inviting members to select the ones that affect them or they won’t get fixed. Asking members to check if their bugs are at the top of the list, or they might miss out on getting it fixed. Having quarterly ‘closures’ of time when people can vote on which bugs they want fixed next. Email campaigns highlighting time is running out to get your bug fixed before the next engineering sprint. 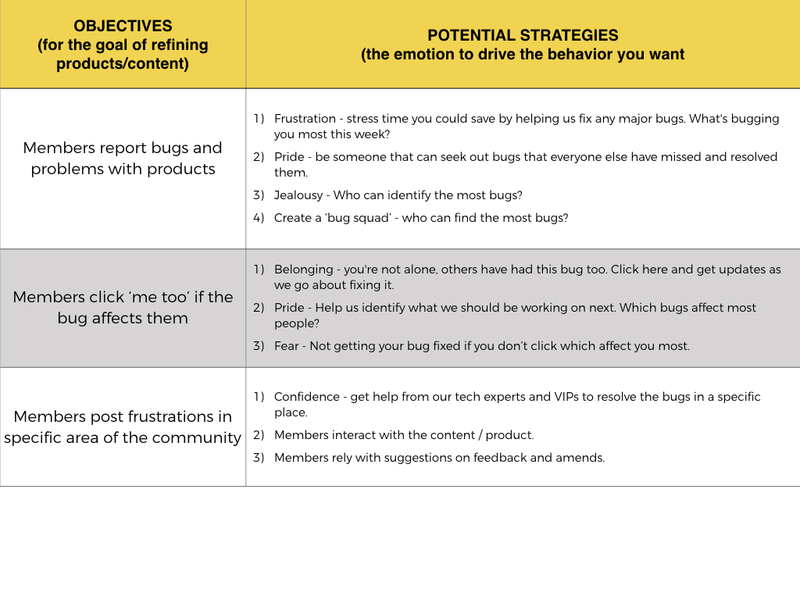 Notice how every tactic embraces the use of fear but for positive aims – to get bugs fixed. By this point, you should have an extremely clear and coherent strategy that connects your tactics, to your strategy, to your objectives, and your goals. You should have moved past the ‘driving more engagement’ and focused specifically on the kind of activity you need members to perform.